I will start with my apology for the lame pun that you can discover in the title. But you know, this might be the opportunity of a lifetime, so I jumped at it… Now, it is time to show you my new short bob. I went to the hairdresser last week, and I’ve rarely worn my hair so short ! I had a a-line bob done a few years ago when I was at the university, but my hair has grown back since. And now, I’ve decided to take the plunge again. I was tired of my “no haircut”, tired of spending hours untangling my knots (and I won’t even mention the word “blow out”…). It’s crazy to think that one day, my hair reached my low back ! Anyway, I’m feeling a lot lighter and I like this fresh haircut ! I’m also showing you this improvised outfit. The nice weather is finally back in Malta – it feels like spring here – and I’m really glad to be able to wear my little dresses again. But an oversized sweater is more than welcome at the end of the day ! Belted over this dotted dress – currently in sale at -50% ! – it gives a chic and pseudo-neglected look to the outfit. I adore this look & your hair. Digging the fresh cut. You look so classically chic. 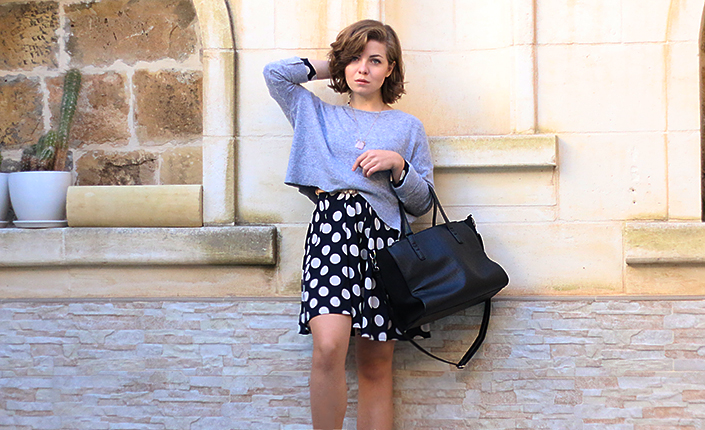 Can’t go wrong with polka dots, right?